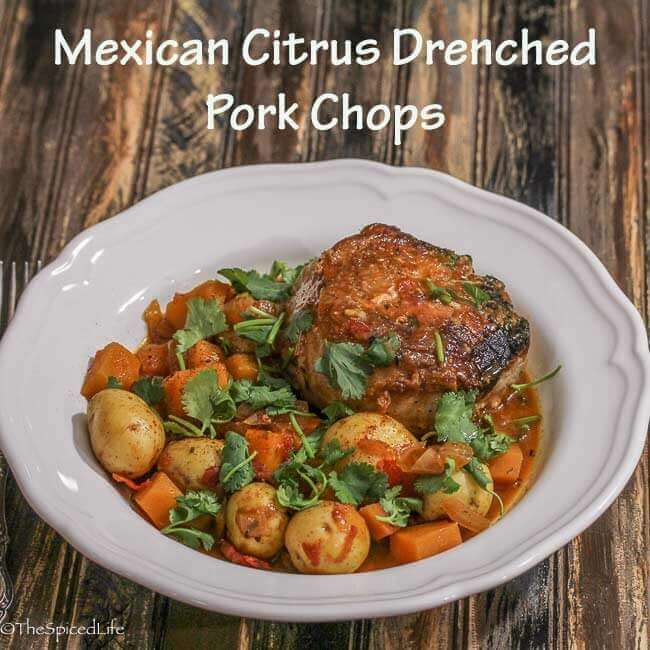 Mexican Citrus Drenched Pork Chops over Butternut Squash and Potatoes is a delicious and unique one-pot meal that celebrates the bounty of citrus season. Affiliate links have been used to link to items discussed. I seem to have developed a new hobby, er, obsession. If you’re not interested feel free to hit that jump to recipe button up there, but otherwise indulge me for a moment. As I am sure I mentioned once or twice, my property in Ohio was a blank slate. Former farmland, all it had was tall grass. Which was great fun, as it meant I could choose various trees, shrubs and gardens to plant, but another thing it meant was I never had any bird feeders close to my house. Fast forward to this house, where we have the perfect small shrubby tree right by my front family room windows. 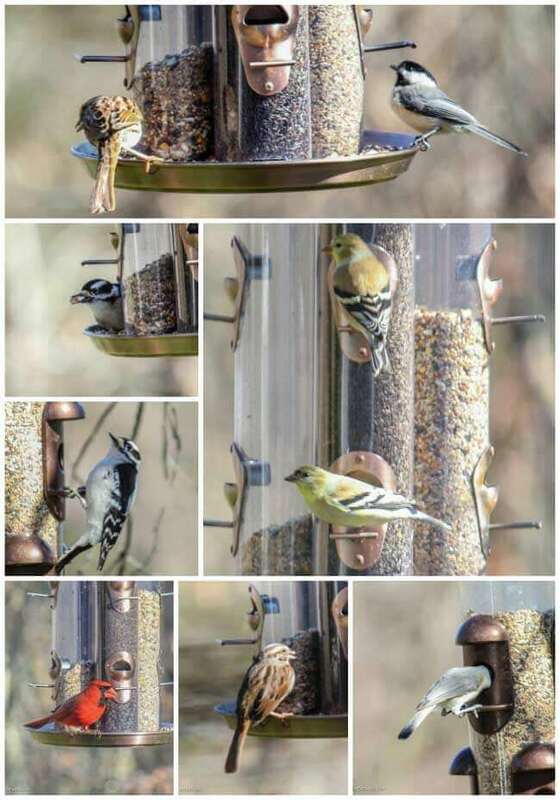 I describe it this way, because it has several smaller trunks with many branches, which means it has plenty of lower, sturdy branches from which to hang feeders. Couple that with the nature preserve next door, and suddenly I have a plethora of gorgeous winged wildlife hanging out by my house. Entertainment for the cat and me! My only problem is that all of the birds (that are around now) except the chickadees head for the hills when I open my window. So all of these photos were taken through glass. Alas. 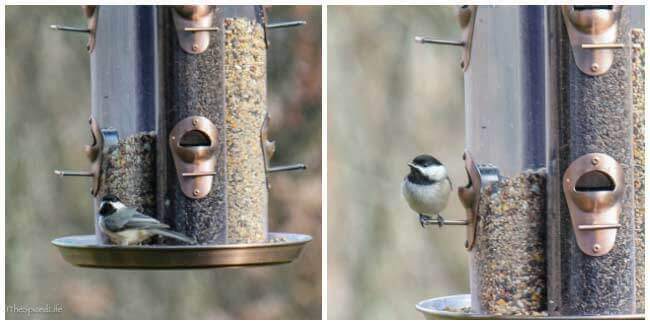 The two pictures above, taken of the ballsy chickadees, were taken with the window open (and no screen). Anyway, the point being you might see the occasional bird photo around here because I have become this crazy person who has my tripod set up, facing the bird feeders through the window, with my more high powered zoom on the camera (nothing like what a proper nature photographer would use though). Because you never know when some gorgeous bird might come by for a bite and I must have a picture of it! 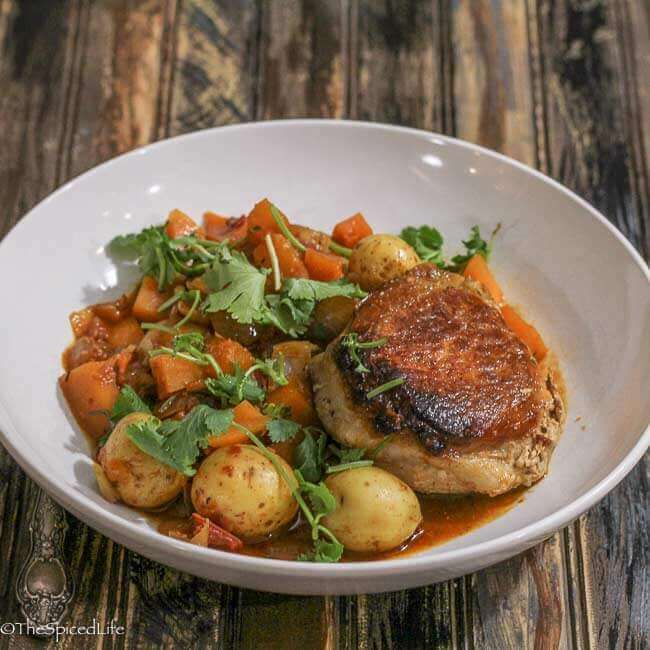 So about this Mexican Citrus Drenched Pork Chops over Butternut Squash and Potatoes! Which has no connection whatsoever to birds and bird feeders, but c’est la vie. 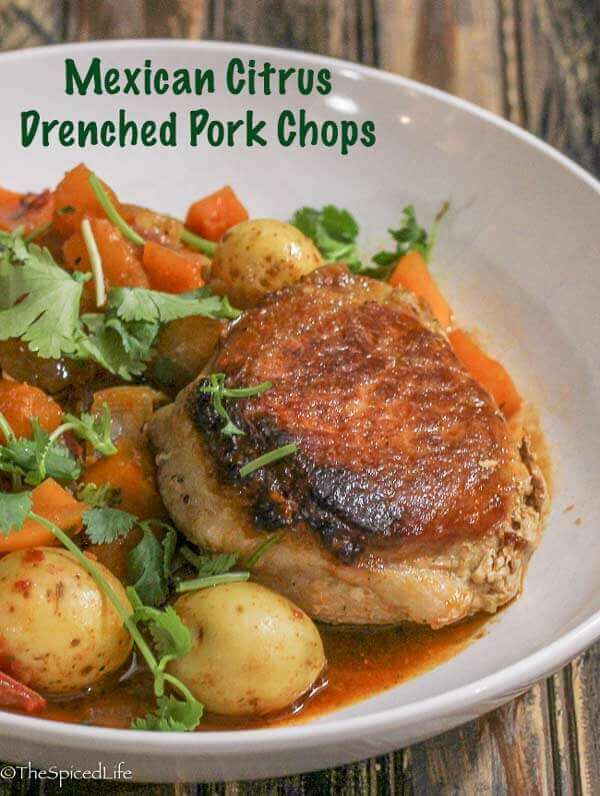 This dish started with a chicken dish in Pati Jinich’s Mexican Today: New and Rediscovered Recipes for Contemporary Kitchens , and while I did make changes, such as subbing butternut squash for carrots and pork chops for chicken thighs, the essence of the dish is fairly unchanged. 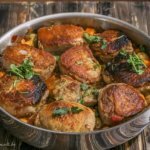 I loved that the dish is made by cooking the meat on top of the veggies–I think that gives one pot meals incredible flavor. And I especially love using so much fresh orange juice in a dish. Citrus is easily one of my favorite flavors. The only way these Mexican Citrus Drenched Pork Chops failed (if you can even call it that) was that my package of pork chops had eight of the suckers–and because I love super thick pork chops and because they were all frozen together, it basically meant this dish was quite huge for the four of us. I wrote the recipe as I made it, but in the future I would either save it for a dinner party (and I do think it makes for a gorgeous presentation) or cut the recipe in half and use a smaller skillet. 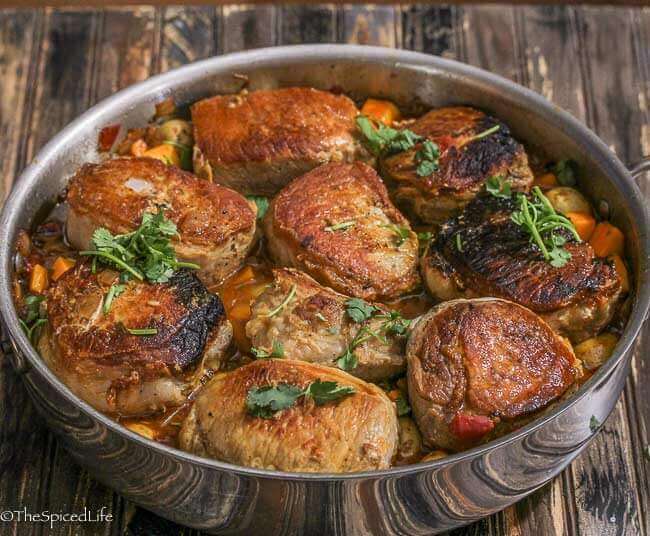 Closely adapted from Pati Jinich; skin-on chicken thighs would also work well in this dish. Using canned fire roasted tomatoes cuts down on time and steps (and works better in the winter where I live), but if you prefer, broil 1 lb ripe, freshly picked tomatoes until charred on each side and then core and chop when cooled. This recipe could easily be cut in half and cooked in a smaller deep skillet. Rub the pork chops with freshly ground black pepper and kosher sea salt. Let sit for 10-20 minutes. Heat the oil in a large, deep skillet--I have a straight-sided 14-inch stainless steel that is perfect for these kinds of dishes. Brown the pork chops over medium-high heat, 4-5 minutes per side. Do them in batches so they do not steam, and remove them to a large bowl and set aside when done. Reduce the heat to medium and add the onions with a pinch of salt. If browning the chops has left any spots ready to scorch and burn, add a splash of water with the onions. Scrape all of the browned bits off of the bottom of the pan while you caramelize the onions. After about 5 minutes, when the onions are starting to brown at the edges, add the garlic. Continue to cook, stirring, for another 1-2 minutes. Add the oregano and thyme, crumbling them into the pan by rubbing between your clean palms (this well help release their oils). Stir and then add the cumin, cinnamon, chipotle powder and brown sugar. Mix into the dish thoroughly and let it cook for about 30 seconds, to roast the spices and bring out their flavor. Add the fire roasted tomatoes and citrus juices. Cover partially and cook for 8-10 minutes, stirring occasionally. The sauce should be simmering briskly and thickening a bit--if it starts boiling wildly, reduce the heat some. Add the butternut squash and potatoes and stir. Cover partially again, once again at a simmer, and cook for 4-5 minutes. Reduce the heat to medium low and nestle the pork chops over the sauce and veggies. Be sure to drizzle any accumulated juices from browning the meat into the dish. Cover the dish and cook, over medium low or low (my cook top runs quite hot, so low worked better for me--you want a gentle simmer), for 30 minutes. Flip the pork chops over halfway through. After 30 minutes, the squash and potatoes should be tender and the pork should register at least 150 F. The sauce will be soupy but much thicker. Remove the pork chops to a platter. Increase the heat to medium or medium-low and simmer the sauce briskly for 3-4 minutes. The sauce will thicken further. Taste for salt. Serve hot, garnished with cilantro sprigs. This dish is a prime example of when the kind of cinnamon you use matters. Cassia, or the basic "cinnamon" sold as cinnamon in American stores, will be way too harsh and pungent for this dish. You want the soft fruitiness of true cinnamon, usually labeled as Ceylon cinnamon. Looking for a collage to pin? Enter your email here and never miss a post!